This outdoor chicken coop kit is the perfect home for chickens. This house is set directly on the ground so your pets are able to feel the grass between their toes, or claws. The roof can be opened up from above for easy access to your animals. The living area provides a safe and secure place for your pets to sleep in comfort. The chicken nesting box comes with a divider so you can decide if you want one big room or two smaller. Our backyard chicken coop kit is made of fully treated and grooved fir wood that has been coated with a water based preservative. Security features include lockable metal bolt doors and a galvanized wire run to protect animals from predators. Hinged doors, attached chicken nesting boxes, and a ramp provide ample access inside and out. 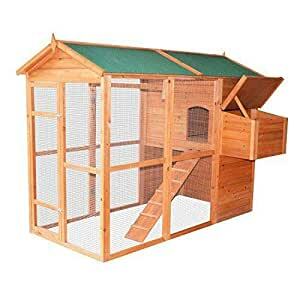 With its great combination of durability, style and function, this PawHut chicken coop is the perfect home for your birds, without having to spend all your money.